Here in Chicago, we go through some intense seasons. Our winters are full of snow, our summers are hot, and our fall brings the rain. 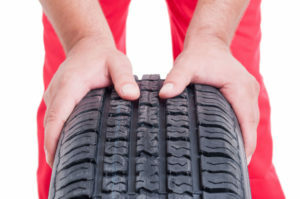 Taking care of your tires can extend their life and keep you safe through out all seasons. Here are some important tips that are not required, but can end up being helpful and cost effective ways to keep you rolling. Checking your tires’ air pressure is very important. Check tire pressure at least every 3,000 miles or if there is any major temperature change. For optimal performance, check the pressure weekly. You’ll find your recommended tire pressure on the inner section of the drivers’ door. Tire pressure decreases in cold weather and increases in warmer weather. Be careful not to over inflate your tires, as this can cause excessive tread wear. Some newer vehicles have tire pressure monitoring systems also known as TPMS. TPMS systems generally will only alert you to extreme low pressure and not compensate for smaller changes in pressure. Keeping an eye on your tire pressure can save you money in the long run. When traveling at higher speeds, such as 70-75 miles per hour, your tread wear can increase by 20% or more. A tire that would have lasted for 50,000 miles at an average speed of 55 will now only last 40,000 miles. Try to lower your top speed to extend the life of your tire. If your tires are misaligned, it will cause uneven tread wear. Having your wheels aligned not only will help extend the life of your tires, it will allow for easier steering. Something as simple as hitting a pothole or curb can knock your wheels out of alignment. We recommend having your alignment checked when you have your oil changed or every 6,000 miles. This is probably the easiest tip to keep up with because tire rotation and balancing is often paired with regular maintenance and oil changes. Rotating your tires will allow them all to wear at the same pace and keep them all functioning properly. If this service isn’t included in your regular maintenance, make sure you’re rotating and balancing every 3,000 miles. Purchase a good set of winter tires. Winter tires use a different rubber that is manufactured to stay more pliant and grip the snow and slush more effectively than all-season tires. Snow tires can also help you safely handle your vehicle in slippery situations and can decrease your stopping distance by 30% – 40%. Having a set of winter tires will also reduce the miles you put on your all seasons. By simply doing basic tire maintenance, you can extend the life of your tires and improve your overall safety and handeling. Take the time and make sure you are properly maintaining you tires to help extend their life. If you would like some help assessing your tires, stop by anytime, and one of our technicians will be happy to help!